Knots are used for very different purposes. For example, in surgery without them can not do. Surgical site, is known for its particular strength, in fact, is a modification of the direct node, where the first loop makes two turns for greater strength. To do a surgical knot, first of all lock the threads in the initial position. Their free ends cross and hold the thumb and forefinger of both hands. Once more crossed strands, and place the third finger (middle) of the right hand over the thread that keeps this hand. The thread that holds the left hand, place the nail of the third finger. Now get that finger for the thread that continues to hold the left hand. Guide the thread through the resulting loop and straighten the finger. The free end of this thread now press your thumb to the Palmar surface of the middle finger. Keep the index finger over the thread. Take yarn to opposite sides of the index fingers of both hands a little slip knot. Now tie the second node according to the described scheme, but use the other hand. The principle of surgical site lies in the fact that the first two Palouse don't give two ends of a thread to diverge in different directions, yet fit another Palouse, on top of the already existing ones. The surgical site may be useful in the fishery, when necessary, for example, tying the leash to the line. This loop, the fishermen also called the limit or the drive pin with a loop. First fold line and the leash parallel to each other. Keep in mind, they should touch on a minimum length of 15-20 cm. Tie a simple knot and skipped the whole leash through the loop. Do not tighten the knot and once again miss the end of the line with a leash through the loop. The leash and hold the line on both sides. You can now tighten the knot. 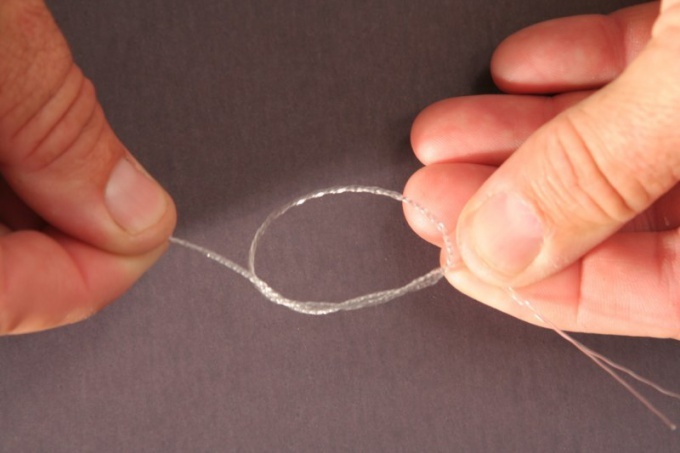 When tightening the knot of the thread should not overlap, otherwise they can peretiraetsya and tear. Be sure to tie each knot to the end. At the initial stage to learn how to tie a surgical knot is convenient and two-tone yarns. To a slippery loop of braided fishing lines is not "gone" and not "floated", make 3-4 turns instead of the usual two. On some types of threads, for example, synthetic nodes can be done using special devices. Silk thread is knotted with a double knot, synthetic triple.